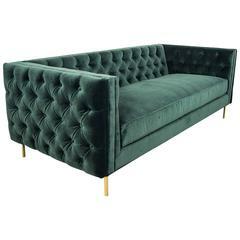 The Irving sofa is where form meets function - this sofa has loose back and seat cushions made of soft foam with feather and down - the square arms have a notch to allow the seat cushion to fit underneath - with a pull out wood tray and square wood legs made and finished in your choice of wood with metal detailing. Available in mahogany, oak and walnut wood for legs and tray. Available in custom sizes - pricing for custom pieces available upon request. 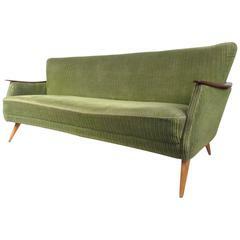 Upholstered in original wool textile, this modern Danish sofa features rosewood paws and angled legs. A carved wood grotto style sofa with a metal leaf finish. This sofa is very comfortable and is not an antique. Our 007 inside out sofa in hunter velvet offers detailing both inside and out. Featuring tufted hunter velvet, a down filled single seat cushion, and our 7&quot; brass legs.